On April 2nd, 2011 Purdue hosted its annual fashion show to allow friends and family to come see what students have been working on all year. As a freshman, we were allowed to put one piece on the runway. 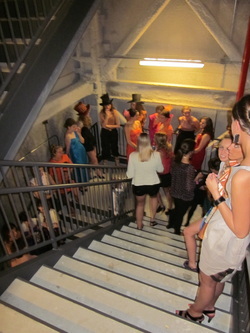 Sophomores and juniors were allowed 2-4 pieces, and seniors got to display an entire line of clothing using 8-15 models. I decided to make a silk dupioni dress with a sweet heart neckline and black piping along the bodice. The bodice was boned and made in corset form. The skirt had waist darts and fell right above the knee. Lindsey Atkinson, my Delta Gamma sister, modeled the garment for me and looked beautiful! To read more about the Purdue Fashion Show, visit the link below. Copy and paste it into your browser. Lindsey modeling my silk evening dress! Helping Genevieve DeSutter's models get dressed.